Investments in safety soon deliver demonstrable benefit to every project. Greater cost-efficiency, a reduced risk of accidents and enhanced employee motivation are just some of the advantages of implementing a professional safety concept on the site. When it comes to safety, Doka takes a holistic, A-to-Z approach that runs all the way from product development to safety consulting, and to its extensive range of safety products and services. At Doka, solutions featuring all-round safety are an integral part of the company’s culture, making The Formwork Experts top-calibre people to work with on all safety issues. It’s only when you feel safe that you can concentrate on the job and perform at your best. An obvious truth, but one that particularly needs to be heeded in construction, where the accident rate is twice as high as in other sectors. Study after study has shown that on safe jobsites, people work faster. Quite apart from human suffering and loss of value-creation, accidents also cause heavy costs ranging from sick-leave to legal consequences which may even include work on the site being stopped altogether. The old objection to installing safety systems is that it “means more work”; Doka has made this objection ever less relevant by developing quick and easy-to-operate safety innovations for every type of forming assignment. A holistic understanding of safety begins right from when formwork systems are still under development. Safety, ease of handling and ergonomic design are among the key characteristics of Doka products. This begins with the choice of materials for the system components, and with the documentation on how the product is used. The use of high-grade materials for all formwork components not only makes them last longer, it makes them safer, too. The Doka product range undergoes continuous testing and onward development with regard to safety, and as a result Doka formwork systems are dependable and efficient equipment for every construction project. 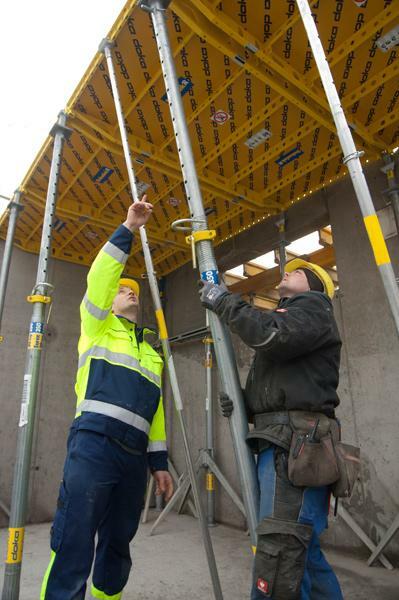 Doka systems unite speed, safety and cost effectiveness on the site. 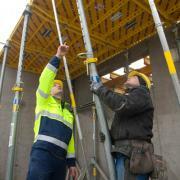 For a high standard of safety, Doka offers complete systems for floor, wall or column formwork. These come with ‘on-board’ protection features such as ladderways or working platforms with integral edge protection. Pre-assembly of the protective elements at ground level, and easy-to-use connector components that allow the formwork and platform to be repositioned in one piece, make for swift, safe work on the site. Doka’s own platform systems, such as Bracket platform M or Folding platform K, are reliable, easy to use and versatile. Vertical-access solutions such as the Stair tower or the Ladder system XS give Doka customers a ‘safe way up to great heights’, with access to all work-deck levels. These systems’ ergonomical design facilitates efficient workflows by letting crew climb up and down with less physical effort – and in safety. New developments such as the Framed enclosure Xbright for the protection-screen system Xclimb 60 provide a new quality of working on the site. With its windproof but translucent polycarbonate inlay, Xbright makes possible a working environment that is pleasant and above all safe. Safety pays dividends in repositioning and handling operations as well. Innovative solutions like the self-climbing and crane-independent Table Lifting System TLS or the high-performing DoKart set a new benchmark for vertical or horizontal repositioning of tableforms and optimise site logistics in terms of safety and speed. As early as in the planning phase, Doka supports its customers with professional consulting and its long expertise with safety issues. In-depth analysis of the initial situation provides the basis for individualised solutions in which suitable products such as ladderways and protection systems are incorporated into the formwork planning right from the start. Efficient usage of formwork systems is achieved not only by the features themselves, but even more so by using their components correctly. This is why high-quality documentation such as formwork utilisation plans, instruction manuals and safety data sheets are such an important basis for a safe site. Services such as practical, relevant training offerings, Formwork Instructors and fielding technical advisers facilitate a high level of safety on-site. Certifications such as the CE and GS Marks are a visible sign of the reliability of Doka products. 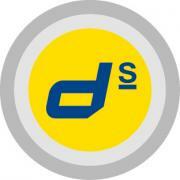 The Doka Safety Network (DSN) gives Doka staff, customers and experts a forum where they can exchange news, views and new ideas about safety. These efforts have won Doka a great many distinctions and safety awards, including the Good Practice Award of the European Agency for Safety and Health at Work, and the Spanish Institute of Building Engineering (CGATE) prize for safety in building construction. Safety is also written large within the company itself. Internal campaigns, and measures that go well beyond what the law requires, send a clear signal. Various initiatives foster awareness of the topic, and make an important contribution towards motivating employees. With the d^s logo, Doka has created its own distinctive symbol that immediately points both customers and employees to safety-related aspects. Every year, a safety spotlight is launched in the company, for World Safety Day on 28th April. Thank you for your interest - The safe way to success. Thank you very much for your interest - The safe way to success.